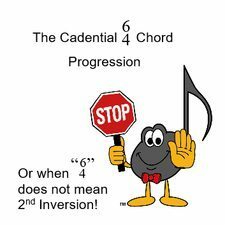 A Cadential 6/4 (pronounced Six Four) Chord Progression is a series of triads (chords) that are played to serve a purpose in the music. These chords sound nice together. They make sense musically. They create a nice "finished" effect. They follow all the rules of harmony and melody that our dear J.S. Bach was so fond of. But sometimes the numbers underneath them just don't make sense! Please note: I am explaining this in the easiest of terms. The point of this blog is to help Teachers and Students understand what the "Cadential 6/4" is. I will not go into great technical details - we will save that for Harmony! Music often uses a "short hand" called "Figured Bass" to indicate what is to be played. This Figured Bass dates back to the earliest writings of music. The purpose of the Roman Numeral was to indicate the required notes (based on the key of the music) and the quality of those notes. Often there are numbers beside the Roman Numerals. Those numbers indicate the position that the triad is to be played in (root position, first inversion or second inversion). Roman Numerals, Major and minor triads are introduced on Page 47 of the Ultimate Music Theory Intermediate Workbook. I am not going to explain these concepts in this blog. These concepts (as taught in the new Supplemental Workbooks, the Intermediate Workbook and in the Advanced Workbook) are the foundation for understanding the Cadential 6/4 Chord Progression. If you are a Student in an Advanced level of piano that is requiring you to play the I - IV - V6/4 - 5/3 - I chord progression at the end of your Tonic Chords, then you should already have finished the Intermediate Workbook and you should be in the Advanced Workbook. If you are a Teacher and have never experienced the satisfaction of understanding the foundation of music through theory (and being able to explain it to your Students so that they "get it"), then sign up for the Online Complete Theory Course now! Glory will work with you through each video, providing you with all those tips and tricks that you need to make theory easy! At this point, I'm just going to assume that you already have this foundation. And now, we are going to explore when V6/4 is NOT the second inversion of the Dominant Triad! When you see this Cadential Chord Progression Figured Bass, it is very easy to "think" that you are supposed to play the Dominant Triad in 2nd Inversion and then the Dominant Triad in Root Position. After all, isn't the "6/4" a short form for a 2nd Inversion? Let's take a moment to look at some triads in 2nd Inversion (6/4) and in Root Position (5/3). Remember - it's all about the BASS NOTE! That's right - the Treble Triad can be in any position. It's the Bass Note that identifies the position of the Triad. When you write a Cadential 6/4 Chord Progression, "6/4" doesn't mean 2nd Inversion. The Cadential 6/4 is actually an embellishment of the Dominant Triad - kind of the cherry and whipped cream on top of the ice cream Sundae. It's not "ice cream" (it doesn't use the notes of the Dominant Triad), but it makes the "ice cream" taste better! That makes sense when you read the notes. You actually are using the notes of the Tonic Triad in 2nd inversion. But it is more important to understand that the Cadential 6/4 is the cherry and whipped cream that is decorating the Dominant Triad ice cream. To write a Cadential 6/4 to Dominant 5/3 progression, start by identifying the notes that are a 6th, a 5th, a 4th and a 3rd above the Dominant note. The 6th will step down to the 5th (in any voice in the Treble Triad) and the 4th will step down to the 3rd (again, in any voice in the Treble Triad). The Dominant will then be repeated in the Treble Triad and in the Bass Triad. Play these Cadential Chord Progressions! Don't they sound beautiful! Did you notice that the Treble Triad can be in any position, but 6 will always step down to 5, and 4 will always step down to 3 (no matter what voice the notes are in!). To Keep It Super Simple, I remind my students that the Cadential 6/4 looks like a "Tonic Triad in 2nd Inversion in disguise". Pop Quiz - Play the following Cadential Chord Progression in D Major. Now play it again in G Major, then in C Major. How many other keys can you play it in? I think it is unfortunate that RCM has gone with this way of writing out the figured bass for the cadential 6/4. When I was in college, we called this chord the I 6/4, with the understanding that it had a dominant function. That made perfectly good sense, the form of tonic but the function of dominant. Now, it seems less clear to me, and I don’t think I am just being old fashioned. I can explain it, but I always have to offer the caveat that I disagree.